It has been sweltering hot here the past few days, almost border-lining on unbearable and I will admit, I have been wearing a lot of shorts and tank tops. But, the other night I was going out with some friends and wanted to dress nicer than just shorts and a t-shirt, so I pulled out this new knockoff Swirl. 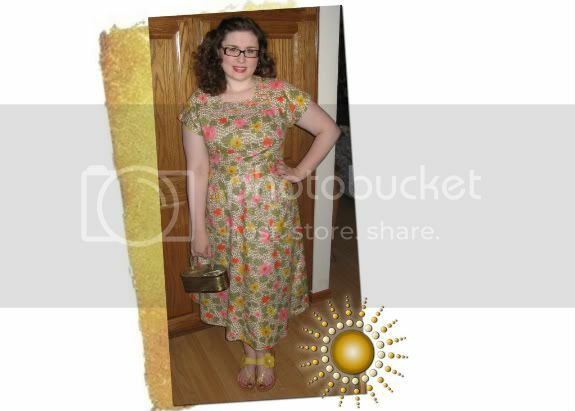 I honestly think it is among the top five of my collection of vintage dresses. I just love it. Plus, I found these awesome sandals that look like they were made for each other! I also took out my new lucite purse for a swing. I think I may need to get another one because I really like how all my stuff fit in it and stayed so organized. And, they are deceptively roomy! Hot Hot Hot!! This weather is crazy but you sure are rockin cute outfits! I absolutely adore this outfit! Your dress is incredible, I love the fabric! Love this outfit, the dress is perfect on you and just right for this weather (OMG thought I was going to pass out in the muggy Chicago heat today). loveliest of dresses and such a pretty print and colors.